Technology continues to affect the way we work, collaborate, communicate and succeed. In a networked and digital environment that provides information-rich content that learners can interact with in order to develop understanding and new knowledge it is imperative that teacher-librarians and school libraries continue to be at the frontline of implementation and delivery of information services and programs. 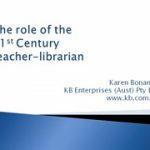 This presentation will explore the impact of emerging technologies on school libraries and how the teacher-librarianship profession can leverage the trends and challenges that will affect the practice of teaching, learning and creativity in P-12 schools in the 21st Century.